Jehye Lee began playing the violin at the age of seven. 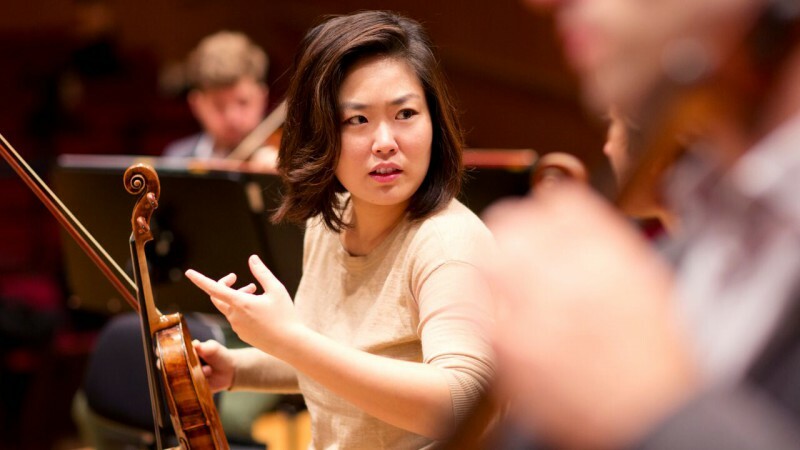 After studying with Nam-Yun Kim at the Korean National University of Arts in her native Seoul, where she took her bachelor’s degree, she earned a master’s degree in performance with Miriam Fried at New England Conservatory, Boston. She then moved in 2010 to Germany, where she perfected her playing under Ana Chumachenco. While studying at Munich University of Music she founded the Trio Gaon, advised by Christoph Poppen and Julius Berger. Since then she has made a name for herself throughout Asia, Europe and the United States as a soloist and chamber musician. Among her many awards and distinctions are a first prize and the audience and chamber music prizes at the Leopold Mozart Violin Competition in Augsburg (2009) and the third prize and chamber music prize at the Tchaikovsky Competition in St. Petersburg (2011), this being the climax of her career at the time. She also received prizes from the Tibor Varga International Violin Competitiion in Sion, the Yehudi Menuhin International Violin Competition and the Pablo Sarasate Violin Competition in Pamplona. She has been invited to many chamber music festivals, including those in Lockenhaus, Ravinia and Kronberg. In 2013 she became the youngest concertmistress in the history of the Augsburg Philharmonic, and since 2014 she has headed the second violins in the Bavarian RSO. Today Jehye Lee concertises in the world’s great concert halls, such as the Seoul Arts Center, Dvořák Hall in Prague’s Rudolfinum, the Golden Hall of the Vienna Musikverein, Victoria Hall in Geneva, the Grand Théâtre in Bordeaux and Jordan Hall in Boston.